Flying with toddlers in tow is never a relaxing experience, even for the most organized of parents. Debate over who suffers more – the parents or the disgruntled passengers erupted among Townsville bulletin readers. Motion sickness, sleep deprivation and cabin fever can bring out the worst in anyone but it’s parents who are often most heavily scrutinized. “Parents should show children boundaries, explain to them what’s happening and the type of behaviour they would expect in that environment as you would in any. It really does depend on the average age of the children. She said parents should know their children and be able to have some gauge of how they would react. “Parenting doesn’t change when on a flight. It should be consistent across all kinds of situations” Helen said. “What you apply before the flight is likely to be the same during the flight and it can be a challenge and if the child’s language is not fully developed you do have to distract and comfort them”. Child Psychologist Nicole Pierotti said it was best to consider the departure times before booking. 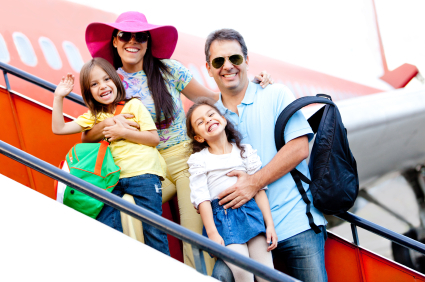 “Cheaper flights are often early morning or late afternoon and that’s not the best time to fly with children. “Look at a time that fits into their normal routine, probably in the morning when you know they’ll be better off. By the end of the day they’re a lot more cranky and there’ll be tears and tantrums.” While domestic flights can be easy, it’s the overnight legs on international flights that can be grueling. Nicole said another way to minimize discomfort is to prepare half a bottle from them for when the plane is taking off. “When the air pressure is adjusting they’re sucking, like lollies or mints they give adults to chew”. The more preparation parents put in the better it is for the child. Also Nicole Suggests keeping balloons in your pocket is great if the plane has been delayed or while your waiting as parents can blow these up and children can play with them, it keeps them moving and it’s not a ball so you’re not likely to annoy staff. Then you can just opo the balloon and put in the bin when it’s time to board. Also snacks and small bottle of water are a must for kids too. Another idea is go to the $2 shop and buy a cheap notebook or a toy car, it’s not actually a precious item and they can put in their backpack when they finish. That way when you lose them in the louge or it rolls under seats it doesn’t really matter. Also Nicole said, don’t rely on the airlines because a kid wants to eat, they’re not going to rely on the air hostess to bring the trolley, so do have water and snacks as chances are you child will be hungry when the hostesses are not ready to serve. Also avoiding window seats is a good plan of attack with children as toddlers want to walk when they’re learning and it’s good to get them moving whilst on a longer flight so take a aisle seat with them so they have room and you’re not annoying other people to get in and out of seats. Most people have earphones one and others they are parents who have ‘been there done that’ will be sympathetic and the people who are irritated and rude usually haven’t been a parent or been in that situation.